“The world’s most impressive archeological site” – according to our Lonely Planet. 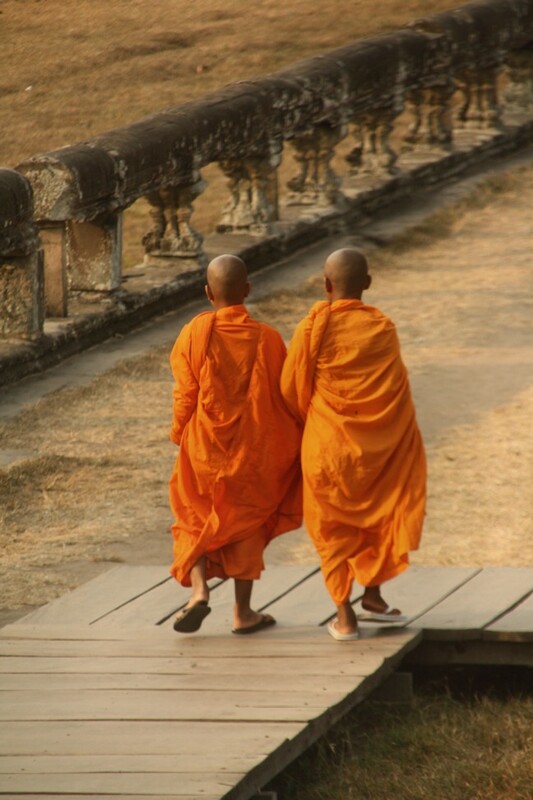 And we excitingly planned our two day itinerary around the temples on the six-hour bus ride from Phnom Penh. The first question to be answered: which means of transport do we choose? We shortly considered hiring bicycles. But then one of us remembered all the times we got lost before: in the little Swedish town of Torsby amidst torrential rain, in the Dolomites just because we didn’t read the guide book properly, on our bikes just outside of Munich. 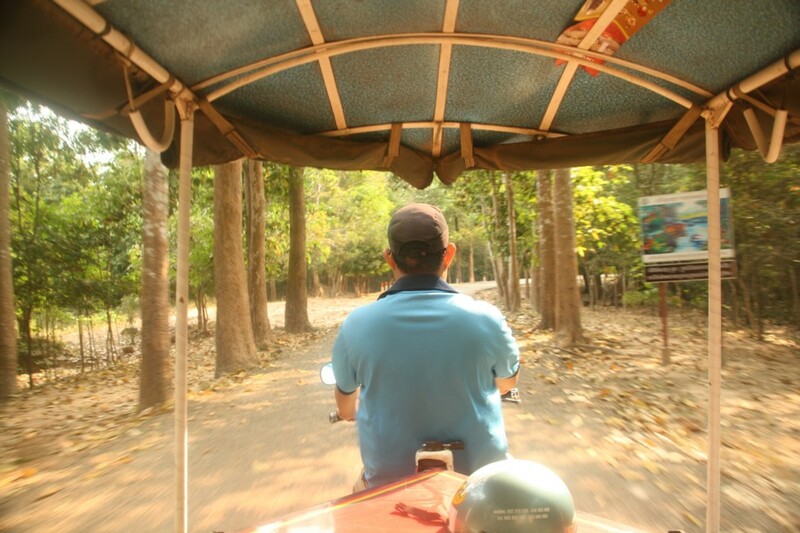 So we redecided: and hired a tuk-tuk driver for the next morning at 7.30am. The second question: “How to dodge the crowds”. 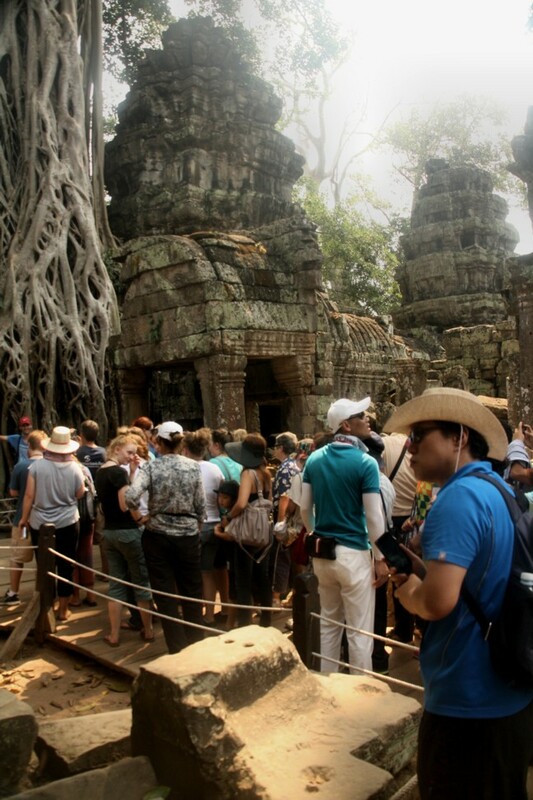 The crowds in Angkor are mainly of Asian descent and appear in groups of around 50-75 people all blindly following one tour guide with a pink umbrella. Apart from one instance, we did manage to dodge them pretty well. So here is how we did it. Leaving at 7.30am in the morning on the first day guaranteed that 1) we were late enough to miss the sunrise but 2) early enough to miss the big traffic jam (!) 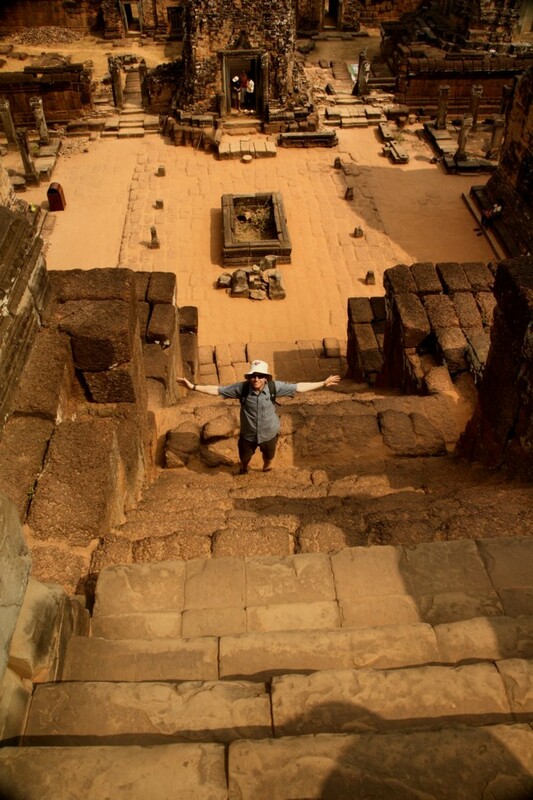 that reaches from Angkor Wat to Bayon. Do not take this route any later than 8.30am otherwise you will find yourself amongst hundreds of tuk-tuks, mini-vans, bicycles and elephants waiting to pass through the Southern Gate of Angkor Thom. We were lucky enough to only see it from the other lane the next day. But first things first. 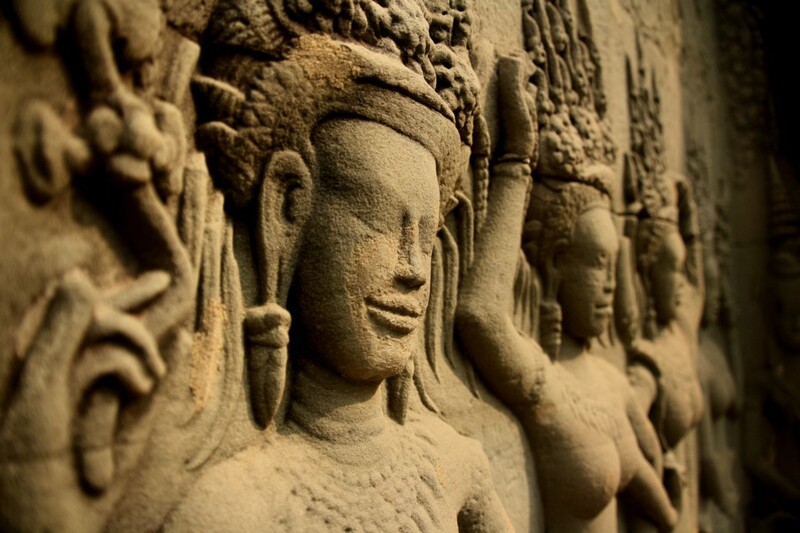 Our first stop was Preah Khan – a fusion temple dedicated to Buddha, Brahma, Shiva and Vishnu. I really liked the massive roots hugging the walls. Unfortunately, the day started a bit hazy so the “photo opps” were a bit harder to spot. Afterwards we went on to Neak Poan, which comes with the describition “if Vegas ever adopts the Angkor theme: this will be the swimming pool”. For some reason most of the area was fenced off and you could only lean across and see it from a distance. This probably was the quickest of our temple experiences. Afterwards we went to Eastern Mebon, still catching some of the nice light while it got warmer and warmer towards lunch time. 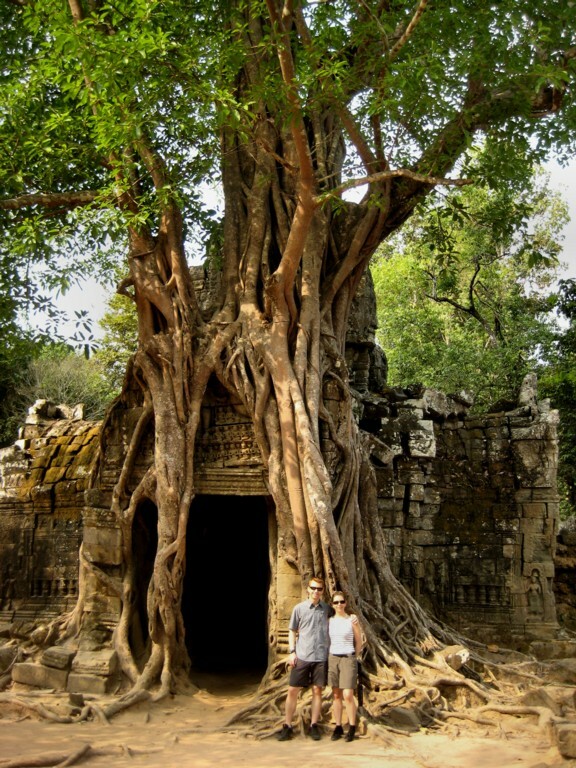 Following the advice of our Lonely Planet, we went to Ta Prohm at around noon. First to escape the hotness and also, at least that’s what we hoped, the Asian tourists who should have gone back to Siem Reap for lunch. But either we were too early, the Asian tourists weren’t hungry that day or they also had their own copies of Lonely Planet. Anyway, the temple was packed with people. We only had a quick pit-stop at Sra Srang: it was slightly disappointing due to building works obscuring the view onto the lake. As it now was 2pm, we decided to move on to Angkor Wat for seeing it in the evening light which would start at around 3pm. The Angkor Wat complex itself was less packed with people than we feared and we spent a good 2.5 hours wandering around the bas reliefs, and climbing up a sort-of-Wat inside the 2nd level on the North Western side. We had it all to ourselves and got some nice shots of the temple. We continued wandering around the 3rd level (the Esplanade), admiring the characteristic towers. 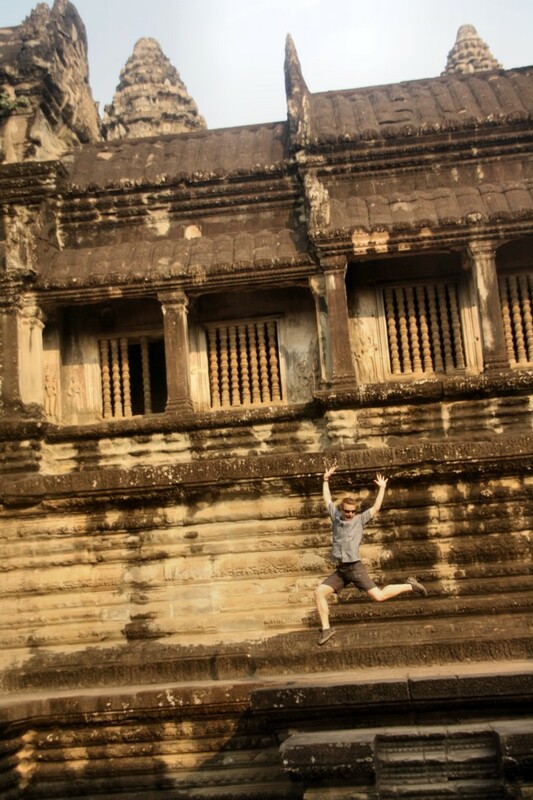 We ended this day jumping around Angkor Wat and enjoying the evening sun.. The next day we started at 5am for the sunrise. What I realized though: both sunrises and sunsets are often accompanied by clouds and haziness. However, the sun eventually will make it through, so make sure you are in a good spot for that. 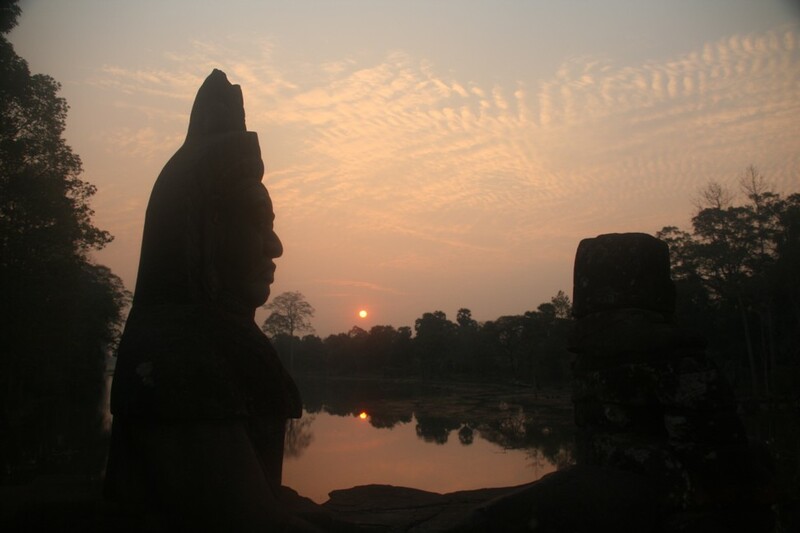 This day we started at Angkor Wat and at 7am moved on to Angkor Thom, enjoying the orange sunrise just in front of the Southern Gate. They normally tell you to leave the best things until last: and in my opinion we did just that. 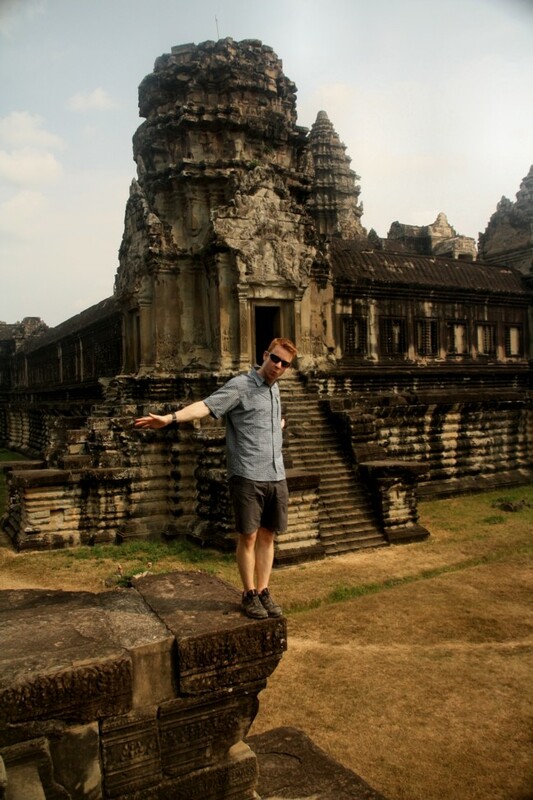 The temple that I liked most was Bayon. 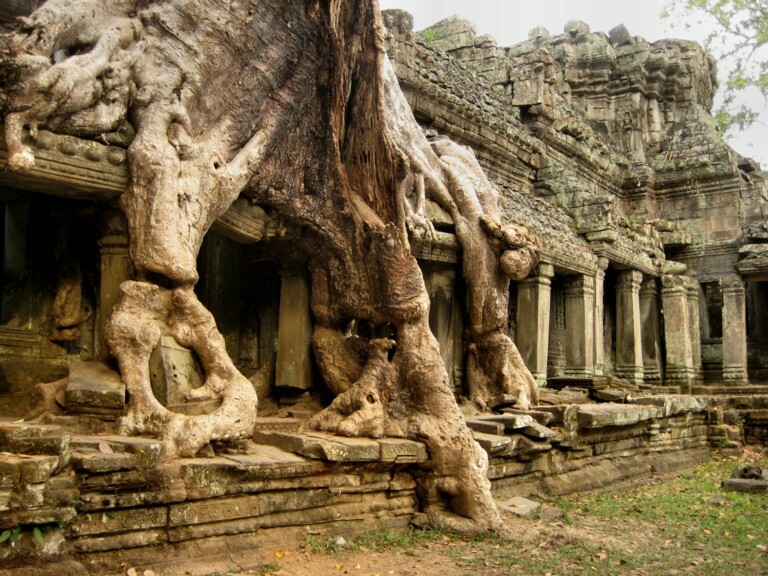 It was built by the Donald Trump of ancient Cambodia: Jayavarman VII. 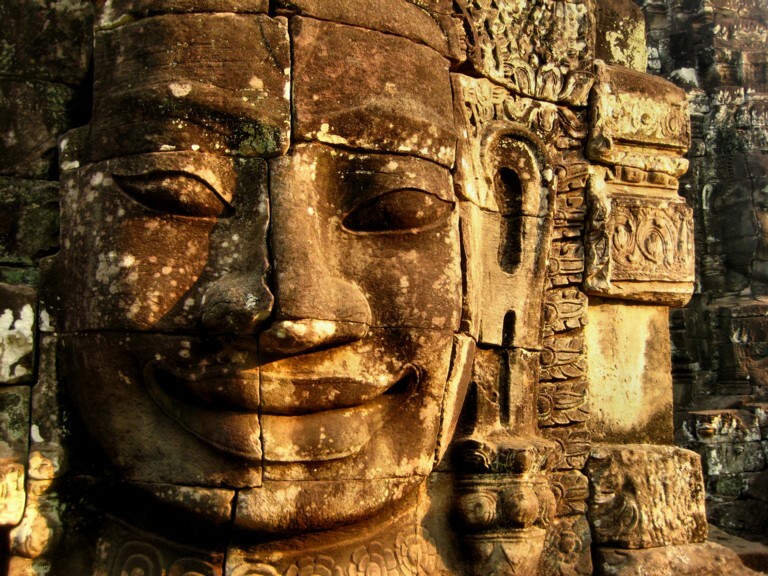 He built many temples (amongst others Ta Som and Angkor Thom) but in Bayon he eternalized himself: 216 faces are incorporated in the walls, all resembling his own. I am not sure how many photos I took of Bayon but just after I had taken my favourite one, the battery of my camera gave up. Lucky me! 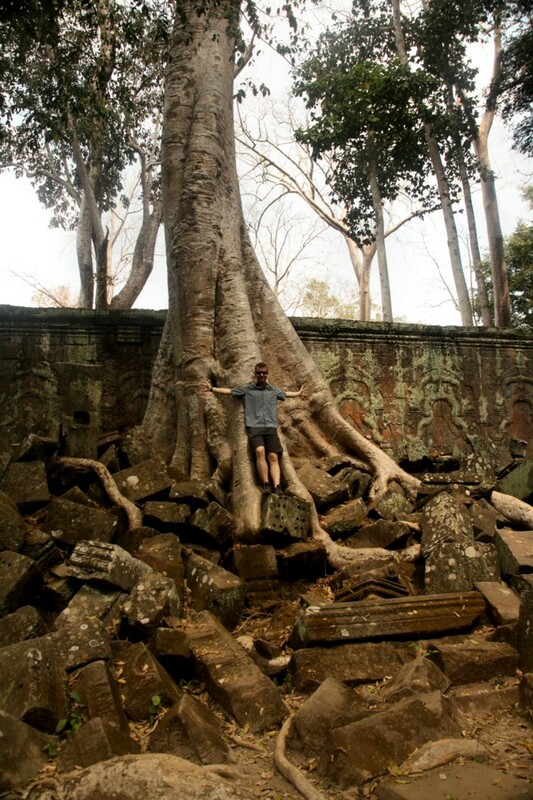 Thus, we wandered around the rest of Angkor Thom without any camera left. It was impressive: the early morning light was spectacular! 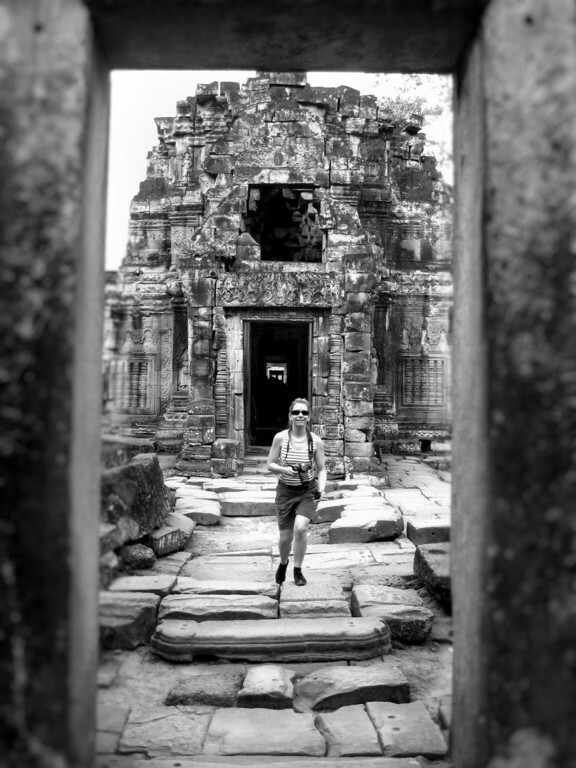 We walked around the terrace of elephants, watched some monkeys play, climbed up Phimeanakas and stumpled around the thousands of stone blocks around Baphuon. Well, and on the way back to Siem Reap we encountered: the traffic jam.